This information was forwarded by the House Republican Campaign Committee (HRCC); feel free to send it on to friends and family as this is an important issue in the 2008 election. In a recent political survey, politician Tom Shively openly suppported a plan to increase taxes on hard-working Missourians by over $1 Billion. 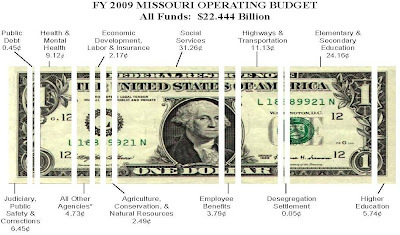 In 2006, the last time he weighed in on the subject, the estimated cost of the plan promoted by Missourians for Tax Justice was $960 million. After explaining the plan, the question read, "Will you support a revision of our Individual Income Tax to make it more equitable and more productive." It references to a legislative package pushed forward by St. Louis liberals Sen. Joan Bray and Rep. Jeannette Mott-Oxford. This isn't Shively's first nod towards more taxes at any cost. As a legislator, Shively voted against a plan to limit state spending. Shively also voted against barring judges from raising taxes without a vote of the people. He also opposed a phase out of the state's outdated franchise tax. Because of his stances against business growth and for higher taxes, Shively received a 60% or failing grade from the National Federation of Independent Businesses. MACON - As part of his ongoing effort to make state government more responsive and accessible for the people of Missouri, Gov. Matt Blunt today proclaimed the city of Macon as Missouri’s Capital for a Day, offering one-on-one and personalized access to state government. Gov. Matt Blunt brought his cabinet and senior staff to Macon to assist with constituent services and meet with Missourians. While in Macon the governor is holding office hours at the Macon County Courthouse to visit with citizens and will make stops at various locations in the area. Cabinet officials and representatives from each department of state government are also on hand throughout the afternoon to answer questions and provide assistance. Capital for a Day gives Missourians an opportunity for one-on-one, personalized government service in their hometown. Some of the state government’s highest officials including Gov. Blunt will be in the city, available to Missourians to answer questions, listen to ideas and visit about state services. State agencies will also hold office hours throughout the afternoon. By bringing state government directly to the people of Macon, local citizens will have even greater access to officials and agencies who can offer assistance. While in Macon, the governor will discuss new economic development assistance for the city, tour a local manufacturing business, visit a drug court session and meet with students in a junior high chemistry class. Macon is Gov. Blunt’s seventh and smallest Capital for a Day. On May 22, Gov. Blunt proclaimed Branson as Capital for a Day. On April 11 Gov. Blunt proclaimed St. Charles as Capital for a Day. On March 14 Gov. Blunt proclaimed Carthage as Capital for a Day; on February 1, the governor proclaimed Farmington as Capital for a Day; on December 5, the governor named Liberty as Capital for a Day; and on October 2, the governor named Sedalia as Missouri’s first Capital for a Day. The Macon County Republican Central Committee met on Tuesday, August 19th at 7:00 P.M. in Macon. 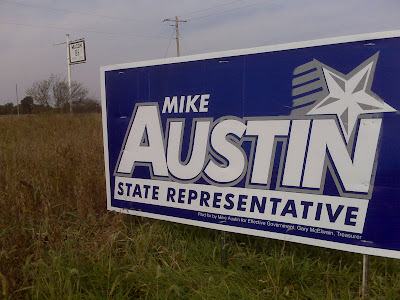 By state law, county political committees must reorganize every election year. New officers elected were Jim Willis of Bevier, Chair, Kathy Austin of Ethel, Vice Chair, Aaron Baker of Atlanta, Secretary, and Jane Thompson of Macon, Treasurer. Jim Willis opened the meeting. Willis, a delegate to this year’s national convention, was elected in 2006 to spearhead the party’s efforts in Macon County. That year, Macon County voters chose the Republican candidate in 5 out of 6 statewide races. Republicans also won the race for Presiding Commissioner with Alan Wyatt. In 2004, voters chose Republicans in 10 out of 11 statewide races. Middle Fork Township: Patty Greenwood of Anabel and Dean Sandner of Excello. The committee will meet again following the November election to plan the annual Lincoln Dinner celebration and establish goals and expectations for the committee for the 2008 election cycle. For more information, contact Jim Willis, Chair, at jimw@willisi.com or (660) 651-1144. Members of the Macon County Republican listserve organized by Aaron Baker, aaronbaker50@gmail.com, will receive their updates as posted on the new Macon Co. GOP Blog at www.macongop.blogspot.com. The messages will be as frequent as they have been in the past. 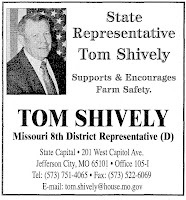 Local voters are questioning Tom Shively's ethics in advertising so close to the 2008 General Election. In reference to a newspaper advertisement in the Macon Chronicle-Herald newspaper on September 16, 2008, a concerned citizen asked party officials about the legality of such advertising. The message read, "I have seen many of these Shively ads in the Macon paper over the past several months. I have often wondered just how they are paid for? They are obviously not paid for by campaign dollars or it would be so stated. Is it possible that Shively is using government provided expense dollars to pay for these adds?" The local newspaper was contacted, stating it would be "unethical" for them to release who exactly paid for the advertisement." The concerned citizen added, "Anyone who examines them closely would probably agree they are a campaign ad.....photo, everything a campaign add might have except how it is paid for." Take a vote on our online poll at http://www.macongop.blogspot.com/. What is your opinion on Shively's advertisements? You can also add comments to this post on that site. Jim Willis of Bevier was one of 58 Missouri delegates to attend the Republican National Convention in St. Paul held September 1-4, 2008. Willis was elected to be one of only 28 at-large delegates to represent the state at the state convention, held Saturday, May 31st in Branson. The convention was the most-watched of the two party’s conventions this year, including the national debut of Vice Presidential candidate, Gov. Sarah Palin of Alaska. 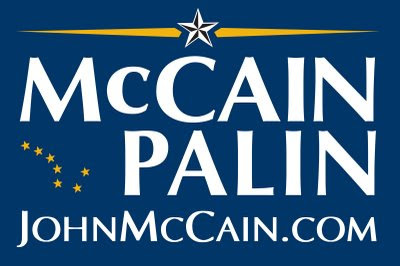 Besides officially nominating and approving John McCain as the conservative party’s candidate for president, delegates amended and approved the party’s platform. Other speakers making presentations to the Missouri delegation included Michael Steele, Fox News Contributor and former Lt. Governor of Maryland, Sen. Kit Bond, Rep. Kenny Hulshof and John Bolton, US Ambassador to the United Nations.